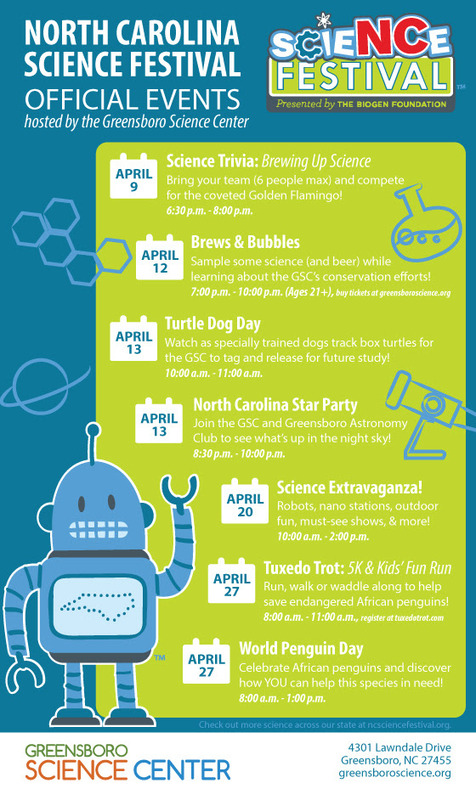 Greensboro Science Center | See what's happening at the Greensboro Science Center! In partnership with The North Carolina Commission on Volunteerism and Community Service, The Volunteer Center of Greensboro has presented the 2019 Governor’s Volunteer Service Award to 10 recipients from Guilford County. The Greensboro Science Center is thrilled to announce that longtime volunteer Linda Kendzierski is among those honored. This award recognizes citizens who have shown concern and compassion for their neighbors by making a significant contribution to their community through volunteer service. The award was created in the Office of the Governor in 1979. Linda has been a volunteer at the Greensboro Science Center (GSC) since 2011. When people talk about volunteer impact, they usually are quick to sum it up in terms of the hours they dedicate to their service. While the 3,000 hours Linda has selflessly served at the GSC are no small feat, they pale in comparison to what she has done during that time. Linda is a champion for the GSC, for conservation and for volunteerism. The GSC team surprised Linda with news of her award on April 1. When I first started at the GSC as an intern seven years ago, I referred to Linda as a social butterfly. She had so much enthusiasm and energy when she joined the program, but there wasn’t an outlet for it just yet. Enter me, a young new volunteer coordinator who didn’t know what she was getting herself into. Volunteers like Linda presented an opportunity, because they wanted to do so much (and I wanted to give them the ability to do more), but I knew I couldn’t do it overnight. Through many conversations over the years, Linda has been a sounding board. She has been a source of good ideas and opinions as well as the heartbeat of our volunteer program. If I need to know how a change is being perceived by our volunteers, I always know I can go to her. She has helped shape our program. Along the way, she has helped shape me into the volunteer coordinator I am today. As our social butterfly, Linda connects people like nobody else can. She is good at breaking down barriers that can sometimes exist between staff and volunteers. She is well-known by her peers and our staff. Part of that is because of how often she volunteers, but it is also because Linda is never afraid to ask a question nor reach out if she needs something. She always introduces herself to her fellow volunteers and isn’t stingy about sharing her email address. When we have events coming up, Linda likes to take the lead to organize them. From National Zoo Keeper Week celebrations to a surprise for our housekeeping staff, holiday social potlucks, birthday parties for staff members… you name it, Linda has planned it. She loves to bring people together. Linda is always taking care of someone – a family member, a friend, a foster animal that somehow finds a permanent home with her. She is such a caring person and always wants the best for those around her. It is what makes her such an amazing mentor for volunteers who are new to the GSC – she makes them feel at ease. Linda is a natural educator. Her genuine love for our animals and for the GSC is clear in every interaction she has with our guests. The fact that she has volunteered in almost every volunteer program we offer makes her an asset here. It is truly inspiring to watch Linda “in her element”, and we know our mission is in good hands when Linda is on shift. Linda loves her behind-the-scenes time with our animal staff, but she also values the impact she can make in her daily conversations with our guests. What a wonderful example for new volunteers to follow! For all of these reasons, when Linda came to us a few years ago and sheepishly asked if the GSC would agree to host a business meeting for about 20 zoo and aquarium volunteers, the answer was an easy one. Within a matter of hours, I was able to let her know that our management team had given us the thumbs up to pursue it. Shortly thereafter, the request morphed into hosting a regional conference for almost 200 people. Again, the answer was “yes.” Our management team would not have agreed had Linda not proven herself to be such a talented and amazingly organized volunteer. We had never hosted a conference of this size before, but we knew Linda could handle this responsibility. What did the conference entail? During the multi-year planning process, Linda was an absolute rockstar. Amping up her drive, she told me that she had finally found was she was looking for. The experience helped her understand more of the behind-the-scenes business logistics that volunteering with us in an animal capacity hadn’t always given her. She reached out to multiple facilities to arrange pre- and post-conference tours, negotiated tour bus contracts, hotel contracts, vendors agreements, speaker details, volunteer-led sessions, and more. It was a truly impressive undertaking. The impact of Linda’s efforts was especially impressive. In October of 2017, the GSC hosted the Regional Conference for the Association of Zoo and Aquarium Docents and Volunteers (AZADV). The seven-day conference was attended by 266 volunteers representing 58 AZA facilities. The conference raised $10,069 for the Silvery Gibbon Project, a nonprofit whose mission is to save gibbons and their habitat. Linda received a standing ovation from her peers at the closing banquet. Linda received a standing ovation at the AZADV closing banquet. Linda has proven that she is an amazing ambassador for the GSC. Beyond that, she is an ambassador for volunteers. She truly believes that no volunteer is “just” a volunteer. Their efforts are to be valued and they have much to share with one another. Through her work with AZADV, Linda is championing this cause. The GSC, our community and Linda’s fellow volunteers are so lucky to have her driving energy and determination behind them. Linda is now the Director of Public Relations for AZADV, and we are excited to see what she does in that role. It is the perfect fit for such a dedicated, accomplished volunteer as she! All those recognized will soon receive a certificate with an official Governor’s Office seal, an original signature from Governor Roy Cooper, plus a gold pin with the inscription: North Carolina Outstanding Volunteer.